1. 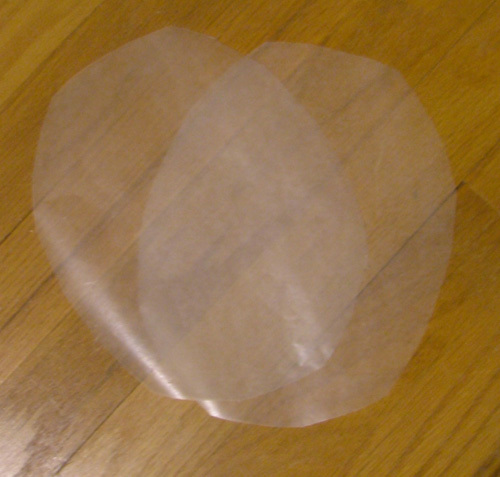 Cut out two pieces of wax paper in the same shape. If you’d like to incorporate an outting with this craft, take children around to look at local churches and draw the shapes of stained-glass windows they see on the trip. They can later cut out their wax paper to match one of the shapes. It’s easiest to fold a large piece of wax paper in half and cut through two pieces at once to make sure the shapes match up. 2. Have children gather flat objects like flowers or leaves in the yard or cut up magazines or cards with pretty pictures. Place on one piece of wax paper. 3. 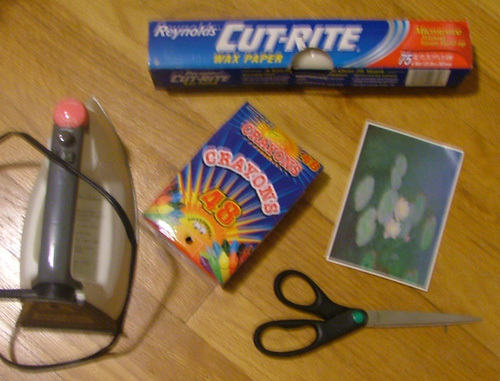 Begin making crayon shavings by using the crayon sharpener and/or breaking up crayons. Children can choose colors that coordinate with their picture or object, or whatever strikes their fancy. This is likely to ruin crayons for further use, so you might want to buy cheap ones for the purpose. 4. This is where the grown up steps in. 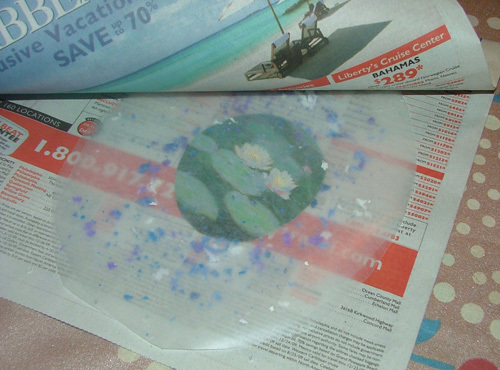 Place the piece of wax paper with pictures and shavings on top of a layer of newspaper on your covered ironing board. Place second sheet of wax paper on top, and another layer of newspaper on top of that. 5. 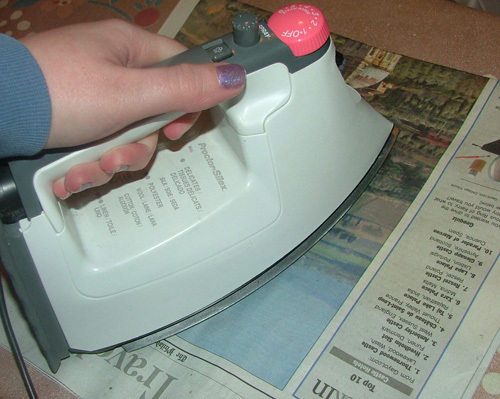 On a medium heat setting, lightly iron over wax paper and newspaper, checking often to make sure you’re not burning anything. It should only take about a minute for all the crayon shavings to melt and the pieces of wax paper to bond together. Crayon “Stained Glass” Cross Craft – Here is a simple craft to do with your children that would also results in some precious Easter decorations to hang from your windows. Crafts for Kids: Stained Glass Leaves – Even if you’re not a crafty person (like myself), it’s worth trying to make crafts with your children now and then because they love it so much! Craft Corner ~ Stained Glass Cross – Well, Easter is coming up, so here is a craft to help us remember what the Lord has done for us. It is also quite pretty! Kids Craft: Stained Glass Window – I remember growing up and making these stained glass windows with crayons with my mother – and loving to do it. Soooo I embellished a bit – being that I am now and adult – I figured it should look like someone at least over the age of 10 created this work of art! Kisha’s Craft Corner: Beautiful Butterflies – If you’re like me, coffee brightens up your mornings. But now, with a little paint and some craftiness, those coffee filters can be used to brighten up your kitchen as well – in the form of beautiful butterflies with a stained glass look! New Technique/Tutorial for you: Faux Stained Glass Melted Crayon Background – I love to play with techniques, especially when I can use the supplies on hand and come up with a interesting way to create backgrounds. So, I have been playing around with a technique that I saw on SCS, melted crayons. I did not want to drag out my iron and I wanted to see what would happen if I used waxed paper instead of foil. Paper Stained Glass Christmas Trees – These Stained Glass Trees add a beautiful glow to the kitchen windows, giving the appearance of twinkly lights on a Christmas Tree. With each triangle tree cut up like a snow flake, it leaves just the right holes for colored tissue paper to shine in. Stained Glass Art (for kids) – We are loving these bursts of color in our windows… being in the middle of February will make you appreciate such things! Stained-Glass Crayons – A week ago, my preschool daughter came home from school with a heart-shaped crayon. She told me she made it in class with broken crayon pieces. She thought it was the best thing ever and asked if we could make some at home. Stained Glass Eggs – This craft was a SIMPLE one. 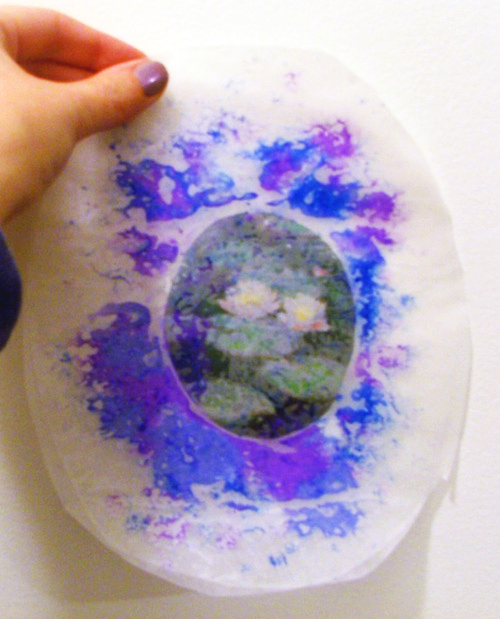 Wax and Paper – Earlier this week, Serena had her playgroup and the craft of the day was wax paper and crayon art. Delaney was thrilled by the pieces that Serena brought home and has been reminding us daily that we need wax paper.